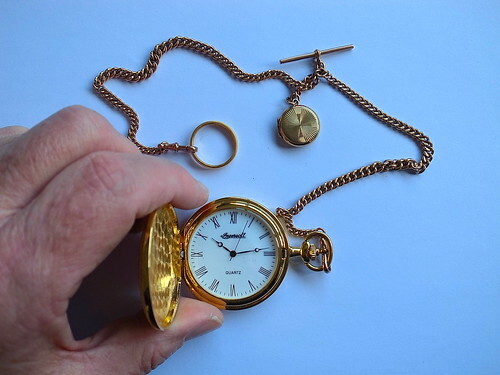 This is my mother’s wedding ring and the watch chain which she gave to my father on their wedding day, 26 December 1930. I gave the locket to my fiancée, later my wife, for her twenty-fourth birthday on 19 November 1963. She gave me the watch in 2000 to wear with my father’s watch chain. I had the locket added to the chain after her death in 2003. The hereios of the We’re Here! group have paid a visit to the World Jewlry group at the suggestion of harpazo_hope. Stuck for an idea for your daily 365 shot? Try the hereios of the We’re Here! group for inspiration. This entry was posted in Wedding accessories and tagged 258365, Chain, Watch, Year. Bookmark the permalink. Great life story! I love the idea, and the clearness of the photo. Beautiful story, George, and a lovely capture of cherished jewellery! That’s a great story, and very touching. You are such a nice man……. thanks for sharing your stories . Wow what an amazing piece of family history! [http://www.flickr.com/photos/harpazo_hope] It is and I’m sure my children will treasure it too. Beautiful image. Please join us and place your image in http://www.flickr.com/groups/clockworks_and_clockpunk_images/. Thank you. Remarkable in so many ways- your personal story and connection with those you love which Time cannot diminish… That’s the real story here, I believe… Thank you for the Lovely photograph and the Life Lesson, George.